My hair is really damaged from all the hair dying and teasing I did a few years ago. I was a heavy 'Emo' in the day so you could imagine the condition my hair was in. It didn't help when I thought T-Gel and Vosene were actually helping my eczema out when I finally realised my hair was even more damaged and crunchy and was stripping the hair dye away. I brought this product on offer in Asda the other week and have started to use it weekly as a luxury for my hair. I can't really afford silly amounts so with everyone raving about this product I thought it was about time to buy this. The tub is huge so it's easy for you to get your hand in and scoop as much as you want out and should last for a while if I'm only using it once a week. A wash my hair in a TRESemmé shampoo about 3 times a week, sometimes more depending what state my hair is in. After washing, a towel dry my hair and then apply the masque and leave on for about 20+ minutes depending when I remember I have got it on. The results are amazing! My hair is super softy and silky afterwards. Just like I've been the hairdressers! 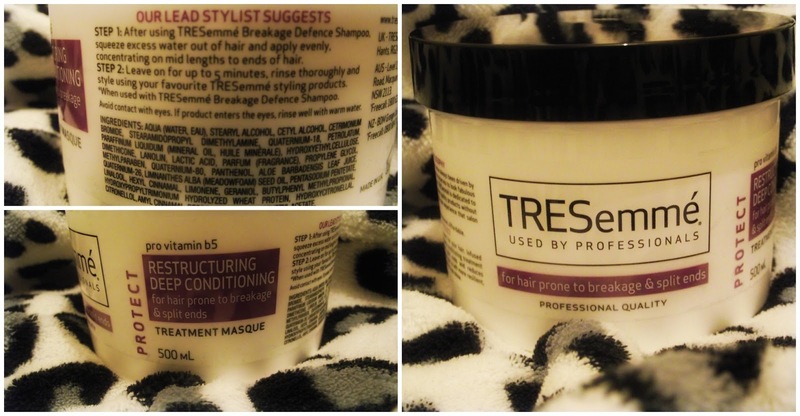 TRESemmé has really grown on me recently, there's been a few products I've tried and I really haven't like but it was just about finding the perfect match for my hair.